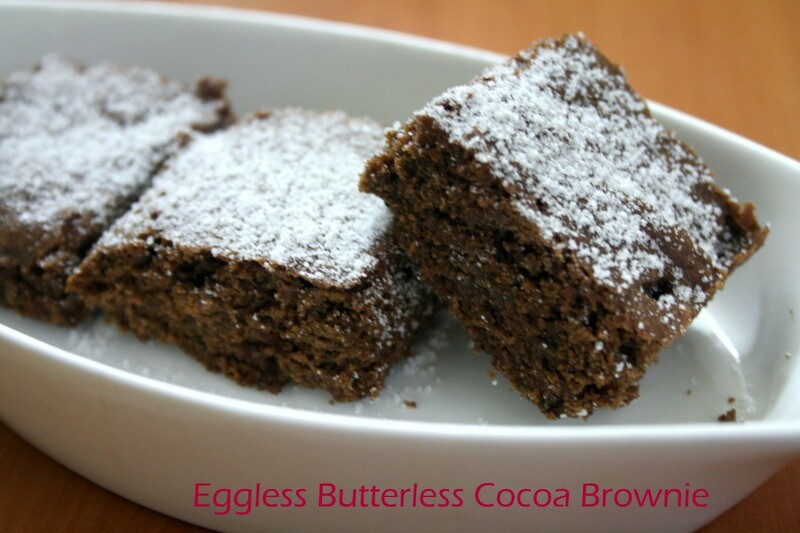 For the brownie today, I have a butterless brownie made with cocoa and nothing else. I didn’t want to use any cooking chocolate and wanted to keep it simple. Moreover Konda has been wanting to try her hand at baking. Since this recipe is the most simplest, I felt she can try. I just directed her and she mixed everything from start to end. We baked it at late night yesterday and the brownies didn’t cool down enough for us to slice and click. So we had to wait for the morning for clicking and tasting. The brownie was just perfect. It is low on calorie as we only used oil. However it makes a great snack to snack on. In a bowl, take the flours, cocoa, sugar and fluff together. Then add the wet ingredients and mix. Finally add the baking powder and gently blend in. In a lined baked tray, transfer the batter and pat the tray down. Bake for 25 mins at 185 C.
Allow to cool before slicing down the pieces. 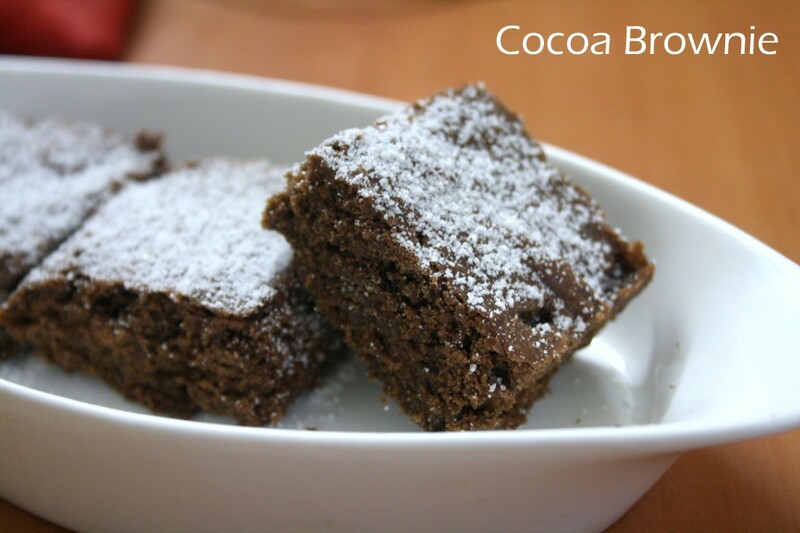 Cocoa brownie looks so moist and yummy. 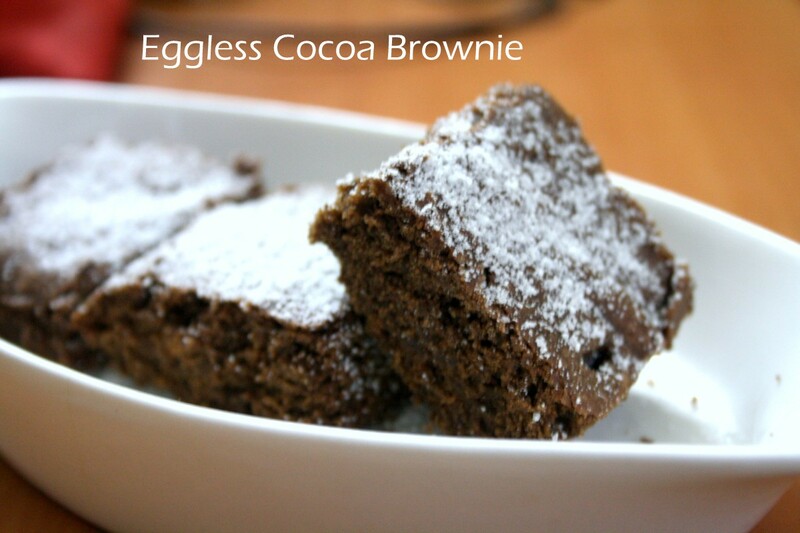 Budding Baker,so nice..Brownie looks so yummy with simple ingredients.. Such an attractive and dangerously addictive guilt free brownies, loving it. Such amazing brownie recipes and each one looks decadent and drool worthy! What a delicious looking brownie without butter or eggs. Butter less bakes are always welcome. Texture of the brownies is perfect.